The professional proofreaders at Edit Syndicate are specialists in proofreading and editing documents of all lengths written by people for whom English is a second language (ESL). With over 100 editing professionals, we are able to pair documents with editors who have experience in your academic discipline. They understand that papers written by ESL clients may require more than simple punctuation and grammar corrections, and they are ready to help. Even though ESL writers may be knowledgeable about the content of their documents and may understand the basic mechanics of English writing, they may need help with the fine points. This is why we recruited editors who are native speakers from the US and UK. They hold advanced qualifications from leading US/UK universities. The staff at Edit Syndicate is composed of professional editors, all of whom have wide-ranging experience in all types of editing; all of them have worked with ESL clients to polish and perfect their documents. 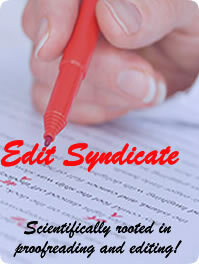 Whether they are proofreading and editing short business memos, college research papers and essays, works of fiction, or full-length academic theses, the editors at Edit Syndicate understand that their job is to eliminate all errors. They carefully read all documents and correct mistakes in grammar, punctuation, English usage, formatting, and any other types of writing problems that may exist. They are particularly conscientious when they proofread and edit documents written by ESL clients because they understand that these types of papers may require additional attention. Clients for whom English is a second language can rest assured that when they submit their papers to Edit Syndicate, they will receive careful, efficient, professional proofreading and editing. Each paper is carefully reviewed by the editor to whom it has been assigned; then the editor eliminates errors in grammar, punctuation, English usage, and formatting. Additionally, he or she improves the vocabulary and the flow of sentences so that they are not only correct, but sound like those of a native English speaker. The editor may also insert helpful comments about the paper for the ESL client to consider.